Dr. David Rosen, Research Associate with the Marine Mammal Research Unit (MMRU) of the Institute for the Oceans and Fisheries recently received a New Technology research grant from the North Pacific Board for $US60,000 to test a new portable device to measure body fat in Steller sea lions and other pinnipeds. Body fat is a prime determinant of animal health for pinnipeds, and researchers will use FatMeter technology, which is currently used in the commercial fish industry to estimate lipid content, to determine whether it will provide reliable data for estimating body composition of Steller sea lions. 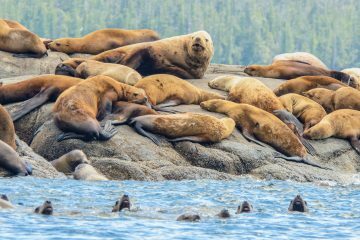 Considerable scientific effort and resources have been devoted to analysing the potential causes of the decline of Steller sea lions in Alaska, and to the development of science-based species management strategies. Being able to reliably measure the relative body condition of individual sea lions is key, however current methods to estimate the relative lipid stores of sea lions are both time-consuming and logistically difficult. Rosen and his team will use a hand-held device that estimates lipid stores in eight trained Steller sea lions. The researchers will collect data during natural seasonal changes in body condition, as well as during episodes of nutritional stress. In addition to the FatMeter readings, Rosen’s team will collect a standard suite of morphological measures, which will be combined into a statistical model to determine the best combination of measures to predict body condition and nutritional status. The goal of this study is to provide a quick, reliable tool that can be used to evaluate the physiological status of Steller sea lions and other pinnipeds in the field.